In celebration of the launch of the “Humble RPG Book Bundle: Pathfinder Worldscape presented by Paizo and Dynamite,” Paizo, publisher of the award-winning Pathfinder Roleplaying Game and Dynamite Comics, publisher of best-selling comic book titles and properties, will host a live 10-hour Pathfinder and Starfinder gaming marathon on Twitch to benefit Camden’s Concert and the Comic Book Legal Defense Fund. The marathon launches January 11 at 11am Pacific Time, streamed live from Paizo headquarters on Paizo’s Twitch channel at twitch.tv/officialpaizo. 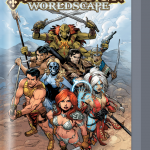 The event launches with “Into the Worldscape,” a multi-genre adventures based on Dynamite’s Pathfinder Worldscape comic, GM’d by Paizo Publisher and Pathfinder Worldscape author Erik Mona. The charity marathon will also include the first public look at Starfinder, the highly anticipated new science fantasy RPG from Paizo, plus a live game demo and an audience Q&A with the Starfinder RPG design team. 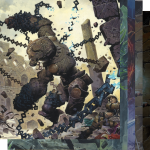 Pathfinder Society developer John Compton will host “Year of the Demon” and Paizo creative director James Jacobs will run key encounters from Pathfinder’s Iron Gods Adventure Path. The event also marks the launch of the “Humble Comics/RPG Bundle: Pathfinder Worldscape and More!” two-week campaign, which features more than $500 of comics and games at a pay-what-you-want price. Bundle offerings include comics featuring Pathfinder Worldscape guest stars like Red Sonja, John Carter of Mars, and Tarzan, while Pathfinder RPG components provide rules and adventures similar to the “anything goes” multi-genre events in the popular new Pathfinder Worldscape sword & sorcery crossover event (issue #3 of 6 on newsstands now). Pathfinder Worldscape was called “One of the best comic book events of 2016” by OutrightGeekery.com. These special issues will not be available in stores, ever. They will be collected in the eventual Pathfinder Worldsape comics hardcover and a limited number with a Paizo-exclusive cover will be available months later for Pathfinder subscribers. This special charity event is the first follow-up to Paizo and Humble Bundle’s previous record-breaking livestream gaming event, which raised more than $250,000 for charity. For a complete line-up all of the day’s activities, visit https://paizo.com/blog. 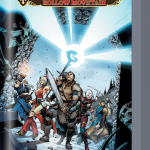 About Humble Comics/RPG Bundle: Pathfinder Worldscape and More! 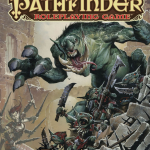 Pay $1 or more for Pathfinder RPG Digital Beginner Box, Pathfinder RPG Game Core Rulebook, Pathfinder Adventure Path: Fires of Creation (Iron Gods 1), Pathfinder Adventure Path: Lords of Rust (Iron Gods 2), Pathfinder #1-12 plus comic maps, and Pathfinder: Goblins #1-5. Pay $15 or more to also receive Pathfinder Society: Year of the Demon Scenario Mega-Pack (27 adventures! ), Pathfinder Adventure Path: The Divinity Drive (Iron Gods 6), Pathfinder RPG Ultimate Campaign, Pathfinder RPG Bestiary, Pathfinder Campaign Setting: Technology Guide, Pathfinder Campaign Setting: Distant Worlds, Red Sonja Volume 2 #1-6 (Gail Simone), Thun’Da #1-5, Warlord of Mars #1-9, Lords of the Jungle #1-15 plus Annual, Pathfinder: Hollow Mountain #1-6 plus maps, and 21 assorted unique posters showcasing various Pathfinder characters! Support charity. Choose where the money goes – between the publishers, Paizo and Dynamite; Camden’s Concert via the Tides Foundation; the Comic Book Legal Defense Fund; and, if you’d like, a third charity of your choice via the PayPal Giving Fund. If you like what we do, you can leave us a Humble Tip too! 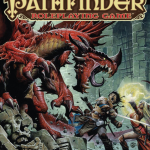 In the best-selling Pathfinder Roleplaying Game, players take on the role of brave adventurers fighting to survive in a world beset by magic and evil. 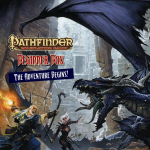 The Pathfinder RPG is currently translated into eight languages, and the vibrant Pathfinder universe has been licensed for comic book series, graphic novels, miniatures, plush toys, and apparel, and is being developed into a massively multiplayer online roleplaying game. 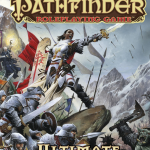 Paizo Inc. is publisher of the award-winning Pathfinder Roleplaying Game, Pathfinder Adventure Card Game, Pathfinder Tales novels, as well as board games and accessories. 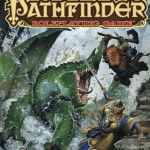 The Pathfinder world, in which players take on the role of brave adventurers fighting to survive in a world beset by magic and evil, is currently translated into eight languages, and has been licensed for comic book series, graphic novels, toys, and apparel, and is being developed into an MMORPG. Paizo.com is also a leading online hobby retail store, offering tens of thousands of products from a variety of publishers to customers all over the world.